Rich threads of platinum meet in the center to capture this old-European diamond in this antique filigree wedding ring. This bezel set center one-half carat diamond captures your attention. Three white diamonds slide off each tapered shoulder in finely handcrafted millegrain square, diamond patterns. 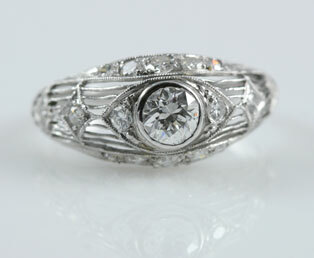 Five diamonds in graduated sizing rest close to the skin as they face both directions in this early 1900s ring. The fine threads of platinum are feminine and appear fragile, however, they are very strong. Exceptional grace and beauty are alive in this special ring. This estate cocktail or engagement ring is crafted in platinum. What is antique wedding jewelry filigree?